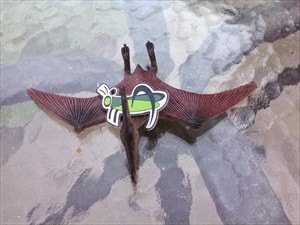 Sheppy's Blog: Missing Taco Pterodactyl? 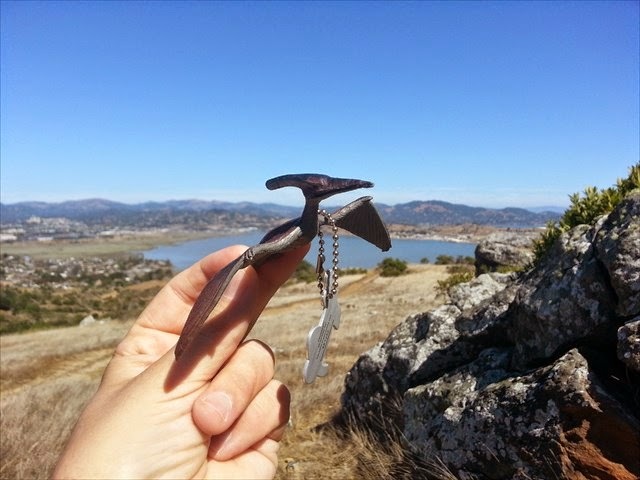 I'm afraid my travel bug, Taco Pterodactyl has gone missing. Taco is my second oldest travel bug, and until recently, the oldest one still surviving. For quite awhile he was traveling across Florida with one geo-cacher. On December 31th, this geo-cacher said "good-bye" to my little Taco Pterodactyl and dropped him off at "Want a Steak, Want a Shake, or will you get Gas?". Assuming that the January 5th log is correct, and that cacher did not just miss Taco Pterodactyl in there, either someone picked him up and forgot to log him, or someone picked him up and didn't know to log him, or someone stole him. Of course, I am hoping that someone just forgot to log him. Perhaps by the time you read this, it will have been logged. Experience tells me, however that there is a decent chance Taco Pterodactyl is lost forever. I find that usually when a bug goes missing, he stays missing. All things considered, though, Taco Pterodactyl has had an amazing run. 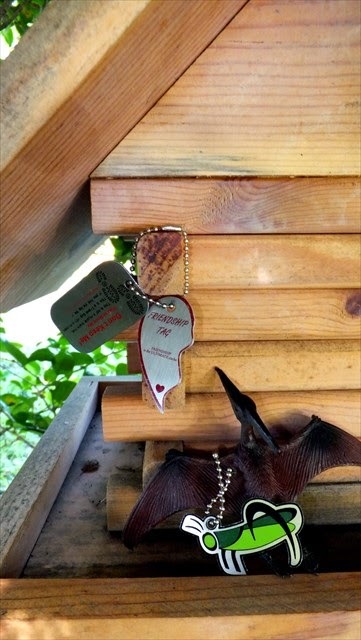 He was released Saturday, August 24, 2013 and in that time has traveled from Colorado to Wisconsin and back. He took a road trip stopping in several states between Colorado and California. He went to the Pacific Northwest, and flew across the country to Florida. If you are curious, check out his Trackable Item Map. He has had an impressive run, and I would be happy if any of my other travel bugs go half as far as Taco has made it . Still, if this is the end, I am sad. Hopefully he shows up. For what it is worth, I have sent messages to every person who logged a visit to "Want a Steak, Want a Shake, or will you get Gas?" between December 31 and January 5. My hope is that when the offending cacher sees my email, he or she will immediately remember to log Taco. Two out of the six have already responded telling me that they did not take the bug and do not remember seeing him. I've gotten 4 out of 6 responses. No one has seen Taco. sigh. Ok ... I still have not gotten the last two responses. I did get a "discovered" log on Taco, though, so apparently he is out there somewhere, presumably where geocachers can get at him.